Plan de Paris et ses Fortifications. 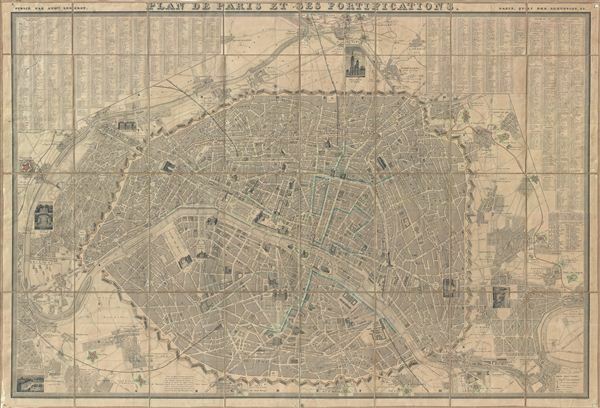 This is an extremely attractive 1843 folding map of Paris and its fortifications by A. Logerot. The map covers the embastilled center of Paris as well as the immediate environs including the 14 ring forts. It also includes some of the surrounding territory including the Bois de Boulogne and the Bois de Vincennes. Gardens, monuments, and parks are illustrated either in profile or in the form of vignette engravings – making this an ideal companion for the curious tourist. Shows exceptionally remarkable attention to detail in the public gardens where subtle expressions of landscape design are apparent. Predates the eiffel tower. An index in the upper left corner contains an alphabetical table of the streets of Paris, while the upper right corner contains a legend of locations included in the fortifications of Paris. The lower right corner contains a legend for the symbols used. This map was prepared by A. Logerot in 1843. Good condition. Some wear on fold lines and to original linen backing.